Zucchini (Courgette) Sundaes, Thyme for Cooking fun gourmet summer starter. They started out resembling Banana Splits - thus the name. A sprinkling of tomatoes halves around them while they bake yields a flavorful sauce. With a small spoon, hollow out each half. 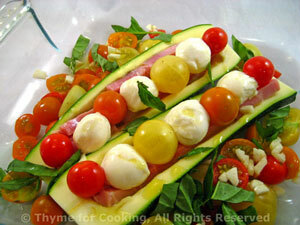 Cut the ham into thin strips and line the inside of each zucchini half with them. Top the ham with mozzarella balls alternating with whole cherry tomatoes. 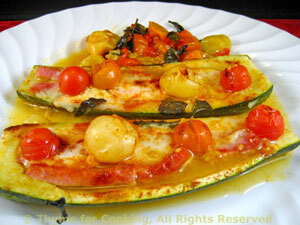 Cut the remaining cherry tomatoes in half and arrange around zucchini. Sprinkle with garlic, basil and paprika. Cover, bake at 400F (200C) for 40 minutes.